I like to keep things simple in life. (At least I like to think so). This is why I ended up making/mixing up my own hand soap to use throughout the house. Do you ever wonder what kind of harmful chemicals, fillers, preservatives, and who knows what else are found in your soaps? Ya, me too! Anything and everything you put on your skin gets absorbed into your body and if it’s loaded with harmful ingredients, those end up in your body too. Yuck! Castle soap is a great replacement for practically any soap you use in your house and it’s made with natural oils and no harmful toxins. The castle soap alone can be used as a hand soap, but to make it more exciting and to customize it so to speak, I experimented with some other ingredients. I wanted a hand soap that was soft and nourishing on your skin with natural antibacterial properties. The essential oils I used all have antibacterial properties, as does the coconut oil. The coconut oil and chamomile are nourishing to the skin as well as healing. Castle soap is made with natural oils so it too is soft on the skin. It is fairly concentrated and therefore can be diluted. The castle soap can go a long way and save you in the long run, bonus!! I choose to use a foaming dispenser since castle soap is generally runny as it doesn’t have chemical fillers to thicken it up. 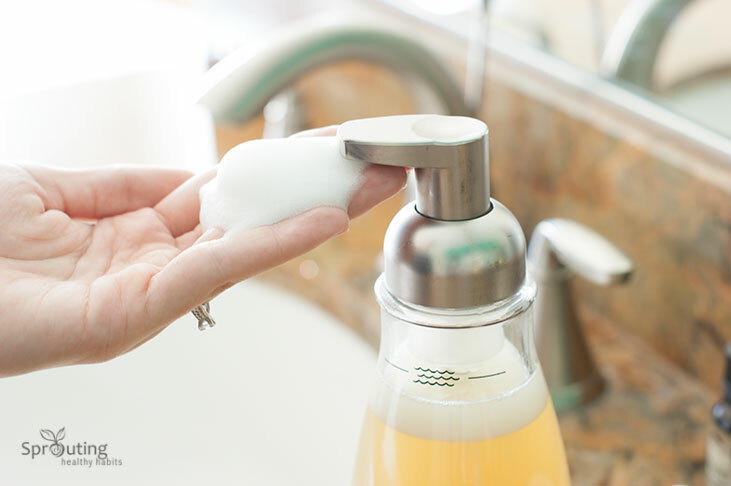 You can use a regular soap dispenser, just keep in mind you wont have an extremely foamy soap when washing your hands. This is because again there are no fillers added to natural castle soaps such as the one in the photo below. Chemical commercial soaps contain fillers to make them foam up more when used (they do absolutely no good….go figure). 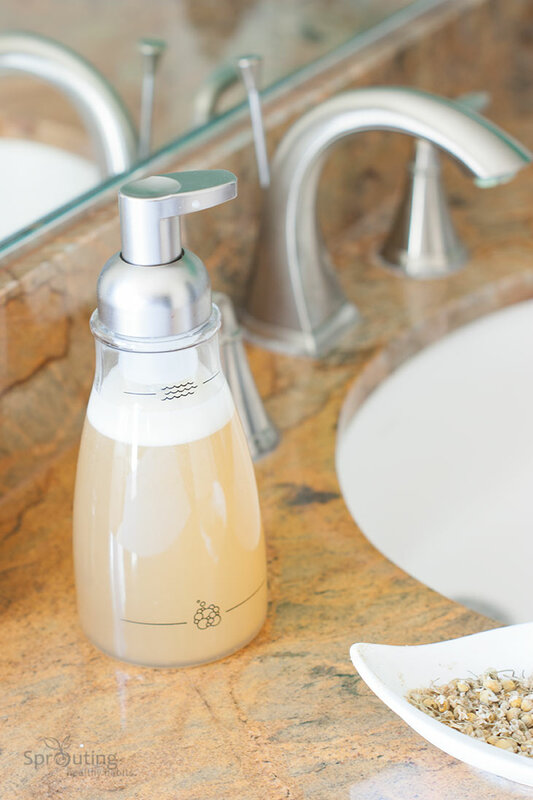 This is the foaming soap dispenser I purchased…I wasn’t able to find a glass or a BPA free foam dispenser so if you have any luck finding one please let me know 🙂 You can also reuse old foaming dispensers from other soaps. 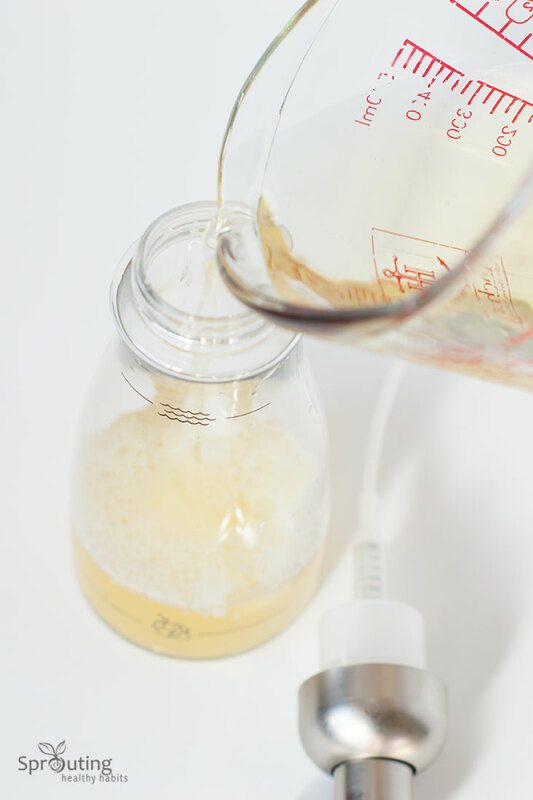 I did this the first time I made my own foaming hand soap and those also work great. You just need to take apart and clean out the dispenser. Another thing I want to note is I haven’t made this in large batches therefore I’m not sure how long it would last. 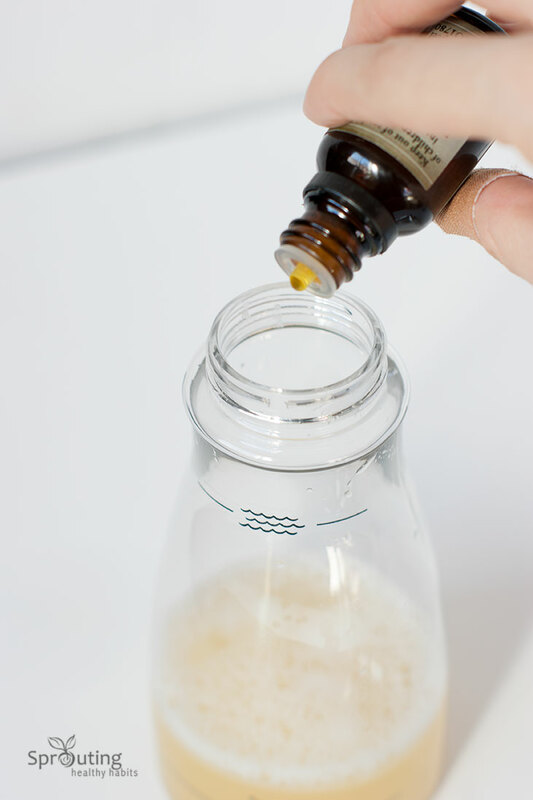 Generally we go through our bottle within about a month or two, and it’s so easy to put together that I haven’t bothered making larger batches to store. Also, you may need to shake up the bottle every once in a while since it’s possible for the mixture to separate slightly. 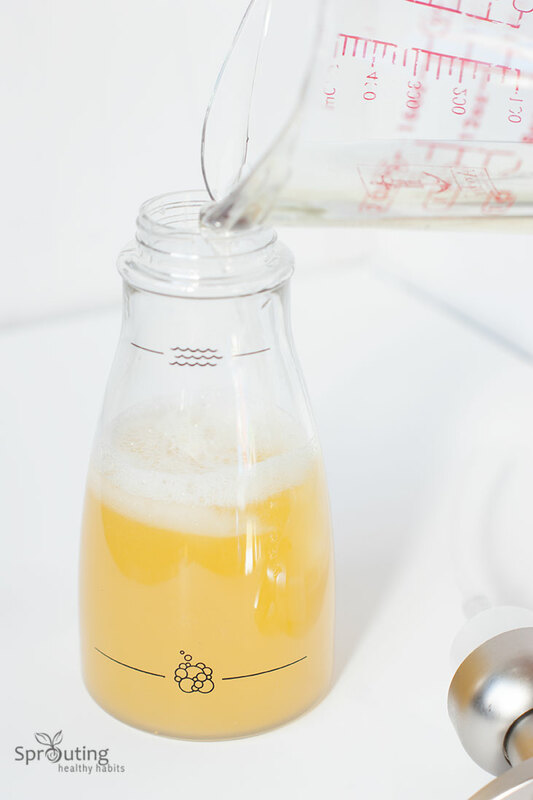 Fill Bottle or Jar with remaining tea. 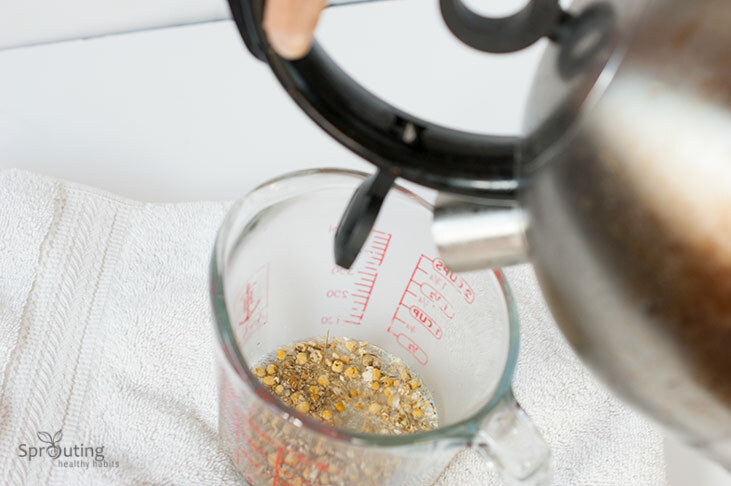 Bring Distilled water to a boil and make a tea (with the chamomile flowers). Allow to steep for about 10 minutes covered and uncover the container to allow it to cool. Pour in the remaining tea and your finished! 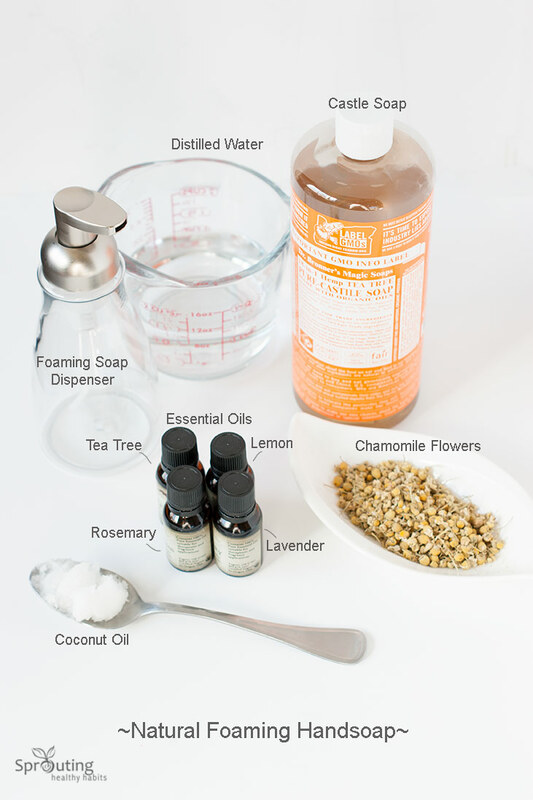 Hope you enjoy this recipe, and I encourage you to switch out your soaps for natural options! For more great recipes and ideas be sure to follow sprouting healthy habits on facebook. Be sure to also check out this post on castle soap. Hello Venessa! This soap seems all good. I would love to do it for me. I’m starting to really like a more natural life. I not find the Castle soap here in Brazil. You could indicate another soap, to replace the Castle soap? * Sorry I used the Google translator. Ângela, Thank you and that’s great to hear! I am happy for you! Are you able to order some castle soap over the internet? 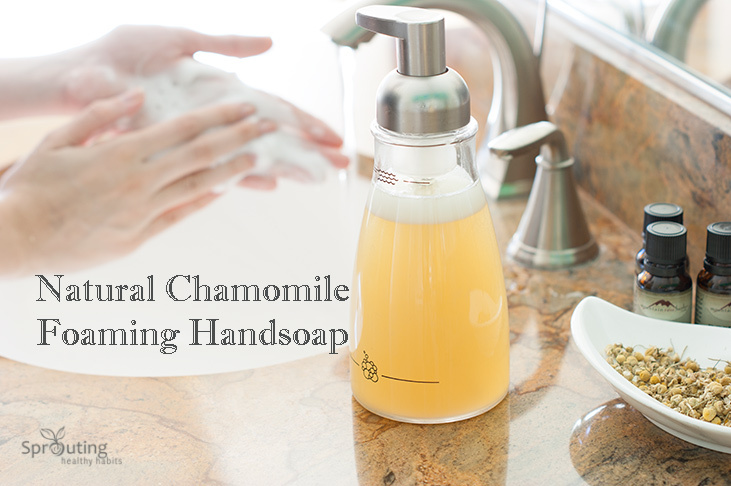 If not you may be able to find a more natural soap liquid soap in Brazil and use that instead. Really any type of liquid soap would work. Hope that helps! Wishing you all the best! Hi Venessa love this recipe! How long will the soap last? Do I need to store it in the fridge? Thank you Krystal! I would say a month to 2 months. 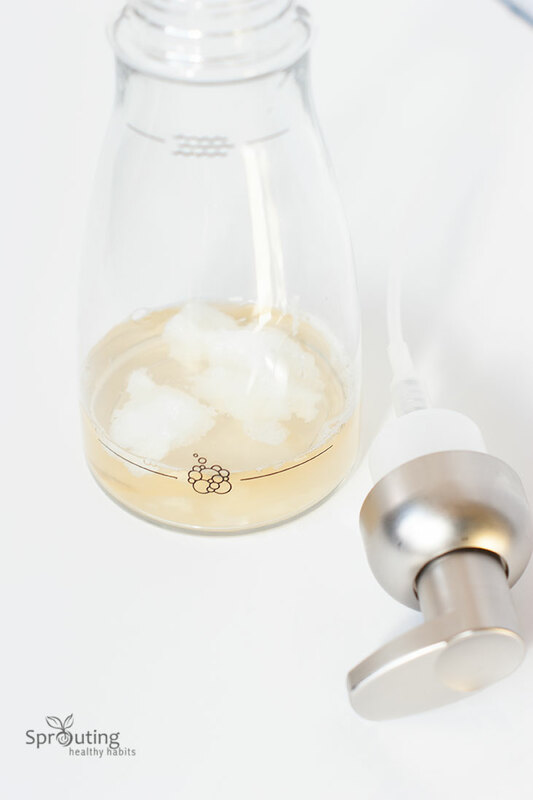 You don’t need to store it in the fridge but may need to shake the bottle or jar up as it can separate. Hope that helps! Best wishes! You mention one part of castiel how much is a part, a cup half cup, PLEASE explain more thanks. One part in general terms means whatever you are using to measure. If you use a half a cup. 1 Part would be a half of a cup, then 4 parts etc. would be 4 1/2 cups. Hopefully I explained that okay. Let me know if you still have anymore questions. Thank you!